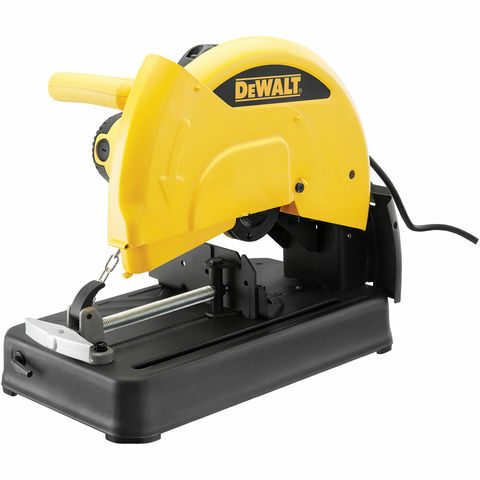 The DeWalt D28710 335mm Abrasive Chop Saw has a powerful 1800/4.0 HP motor that provides overload protection, increasing performance and durability. It has an ergonomically designed "D" handle that provides a more comfortable hand position, reducing fatigue and increasing productivity, Quick-Lock Vise allows for fast clamping on different size and a 45-degree pivoting fence that allows for fast and accurate angle cuts. Featuring spindle locks for quick, easy and safe wheel changes and aluminium oxide grade disc for long life and smooth, fast cutting, the D28710 from DeWalt is a high performance machine, produces various different cuts, for many applications.